Mir Jalal (1908-1978) - 90th Jubilee - by his son, Hafiz Pashayev, Azerbaijan's Ambassador to the U.S.
by his son, Hafiz Pashayev, Azerbaijan's Ambassador to the U.S. It's only natural for a child to endear himself to the memories of his father. Though my father died 20 years ago, I still feel his spirit with me. As time passes, the memories, the conversations and all those events we shared together tend to blur while taking on a rather divine characteristic of their own. Mir Jalal, author of short stories that poked fun at Soviet bureaucracy. 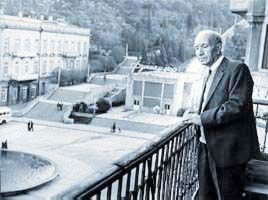 Here he is standing on the balcony of his apartment complex--the setting for "Scoldings." Many details of my father's life are reflected in the stories he wrote. Whenever he encountered an interesting event or person, he would say, "Now, that would make a good story!" or "That's a story in itself!" And I could be sure that next morning a story would be waiting for me to run down to the Writers Union so that his secretaries could type it. Many people have observed that Mir Jalal was able to combine authorship, scholarship and teaching into a single career. Though success in any one of these fields would have secured him a place in the cultural history of Azerbaijan, he succeeded in all three. Some people thought writing came easy to him, but there was more to it - untiring dedication, an active mind and talent. During decades of teaching at Baku State University, Mir Jalal's students used to ask him about his scholarly and creative works, wondering which he regarded as his masterpiece. "My greatest achievement in life," he would tell them, "is my family." Mir Jalal had been separated from his own family in his youth when they returned to Iranian (Southern) Azerbaijan, and he continued high school in Northern Azerbaijan (at that time Soviet Azerbaijan and today, the Independent Republic of Azerbaijan). My father had three sons and two daughters. His wife Pusteh Khanim (who is still with us) was his life-long partner. Mir Jalal always tried to set an example for his children and students. He chose friends for their ideas and outlook on life, not because of their status or Party affiliation. His life as well as his stories are filled with simplicity and naturalness, unpretentiousness and modesty. He never wanted to bother anyone or have to depend on anyone - even his own children. He always used to walk to work. When questioned why he didn't drive, he would counter, "But I have the keys to all the cars in Baku," and would pull out a bill, the equivalent of a taxi fare. After completing high school (1958), I often talked with my father about which university field to enter. Though I was inclined towards the sciences, I did have an inkling for writing as perhaps is only natural for someone growing up in a family of writers, but my father discouraged me. For him, the 20th century was the age of science and technology and thus I became a physicist. Mir Jalal did his best to avoid any involvement with Soviet administrative offices. Whenever it was necessary to get involved, he would ask one of his students to go in his place. One of his students recalled Mir Jalal saying, while passing the Central Administration Office of Baku one day, "Thank God, I don't have anything to do with this place." Of course, his satires such as "Anket Anketov" or "Dried-Up in Meetings" clearly point out the destructive nature of the Soviet bureaucracy, especially under Stalin in the 1930s and 1940s. I'll never forget in 1976, when I returned to Baku from studying advanced physics at the University of California (Irvine). I well remember the day when my father called me into his room and asked me to tell him my impressions of America. At first he listened to me quietly. Then after asking a few questions, he said, "I figured America would be just as you have described it." He cautioned me not to speak openly about my experiences. His generation had lived through the purges of Stalin and Bagirov [Stalin's representative in Azerbaijan]. It was difficult for him not to be fearful. In the 1970s, the economic situation in the Soviet Union worsened and Mir Jalal posed the rhetorical question: "What will happen to the Soviet Union in the future?" I'm sorry that he did not live long enough to answer his own question. No doubt, he would have been proud that his pen so accurately pinpointed some of the incongruities and ironies that led to its disintegration. The story that follows, "Used to Scoldings" is based on fact. It took place in the apartment building in which we lived. It reflects a mentality that the Soviet system fostered - to always expect a scolding, even when things were going fine. Unfortunately, this aspect of the Soviet legacy is still with us today.